Discussion in 'Women's International' started by shlj, May 28, 2018. West Ham promoted from the third division to the first, Sheffield United from the fourth to the second, Lewes, Leicester and Charlton from the third to the second. Manchester United start the club from scratch as they don't have a team today. sbahnhof and CoachJon repped this. Hmm weird that they're okay with an odd number of teams... Good to see Millwall still up (for now) though. I assume they (and some others) were the ones granted conditional licenses from the applications? Do you have any thoughts for who might fall through still, or who might still be added? Or is this list final final? England: May 27 saw the decider for the level 3 leagues' champion club. In the final between the southern and northern league leaders, Charlton Athletic beat Blackburn Rovers 2-1 at Bramall Lane, Sheffield. As mentioned above, Charlton can go to the level 2 division, the newly-renamed FA Women's Championship, in 2018/19. Wales: Cardiff Met won the Welsh Premier Women's League (WPWL) 2017/18, beating their closest rivals Swansea City 2-1 in both of the clubs' meetings. Cardiff Met take their fourth title in five seasons, and a Champions League place. Full table is here. Ireland: Women's National League: The 2017 champions Wexford Youths currently have a slight lead in the table. Second-placed Peamount United drew 2-2 at Wexford on April 14. There's a list of the eight clubs and locations on Wikipedia, and match videos on the FAI Youtube. Galway's 2-0 win over UCD Waves was marred by a ref calling manager Billy Clery "a ****ing idiot", which the club say they'll complain about to the FAI. Northern Ireland: Women's Premiership: Linfield Ladies are going for their third successive title in 2018, and Linfield have recorded a 4-3 win v Glentoran and a 6-3 at Cliftonville to lead the league, which has seven teams. But Crusaders Strikers' 2-1 win at Linfield has put Crusaders in second place. Scotland: The SWPL 1 title race is even tighter than last season's – top clubs Glasgow City and Hibernian have drawn in their two meetings so far, 2-2 at Hibs and 1-1 at Petershill. and they've won every other match so far. They'll play each other once more in October. In the SWPL's league cup, Hibs beat Glasgow City in a semi-final. In the SWPL Cup final on May 20, Hibernian faced the SWPL's third-placed club Celtic, and took them apart 9-0. That might be Celtic's worst ever defeat – Soccerway only lists an 8-0 loss in 2011 in its records. another tidbit, current Arsenal's Kim Little was spotted visiting Utah the other day. Does this mean she's thinking of moving there & play once again with her buddy, Lauren Harvey? Sheffiled have withdrawn from the Championship, citing finances, leaving both tiers at 11 teams. If clubs that have made it through the application process – which was designed to create sustainable leagues of professional and semi-professional clubs and players – find themselves unable to fulfil the requirements of those leagues so soon after their admission, then just how stringent has the application process been? Scotland: It's the tightest title race since 2008/09, when two points separated the top 2. This season, it could take goal difference to divide Glasgow City and Hibernian, each with 100% records against the rest of the league. Watch: Leading 2-1 with eight minutes to go, Celtic Women have three players sent off, and Hibernian Ladies score three times to win the game. Match reports by BBC Sport here. The SWPL now goes on a one-month break until July 29. In SWPL 2, Aberdeen are in real danger of a second relegation in two years. SiberianThunderT and blissett repped this. Nice to see the ambition from the Hammers! Should be an interesting season. It'll take a few years to forgive that club for being so anti-women's football in the past. btw.......my heart will beat a million times faster when they announce the Julia Simic signing; what the bleep is taking them so long? Germans are suppose to be more punctual! God, this is really sad - Doncaster Belles have given up and left the Championship. A club that won the very first Premier Division title in 1991-92, and were a founding WSL member in 2011, and easily won the 2017-18 WSL 2 league. Now they'll be down in level 3 or 4.
jnielsen and blissett repped this. The FA clearly wants the women top tier to mirror the men's top tier, so they are forcing teams to get bigger budgets and only teams with money from men's football can do this. jnielsen, blissett and sbahnhof repped this. Lechus7 and sbahnhof repped this. Several teams are gearing up for the UEFA Women's Champions League 2018/19 qualifiers starting 7 Aug. Glasgow City will host a 4-team group, and so will Linfield - the Northern Irish champions meet the Republic of Ireland champions from Wexford. Wales' Cardiff Met are also in the Champions League, playing in Kharkiv, Ukraine. Scotland: The SWPL returns today with Hamilton v Hibernian, each with 9 games to go. For Hibs to become champs, they need to win this and every game, and improve their goal difference, which trails Glasgow City's. Meanwhile Hamilton are threatened with relegation. (Match preview here.) Hibs won the home game 5-1 at Easter Road. Hibernian got the job done on Sunday - a 5-0 win at Hamilton, exactly enough to erase the +5 goal lead of Glasgow City, whose 11-title winning streak is on the line. The full SWPL program will return this Sunday, including Glasgow City hosting 3rd-placed Celtic. Glasgow City beat Celtic 2-0 (video/match report), while Hibernian won 4-1 over Stirling University (video/match report). They're back this Sunday with the "last vs 1st" Edinburgh derby - Spartans v Hibs, who share a ground. And Glasgow City will host Forfar Farmington - the 5th game in 2 weeks for City. 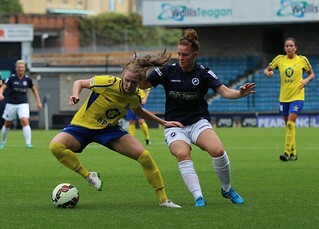 They complained about the 2-day gap between their SWPL and European matches. And the National Leagues are starting on Sunday around the country. Championship-winning relegation sufferers Doncaster Belles will play Blackburn at Rossington Main. Manchester United Women won their first cup match against Liverpool with 1-0.